KEMP LoadMaster Load balancers offer an unmatched mix of must-have features at an affordable price – without sacrificing performance. The built-in Edge Security Pack (ESP) includes some of the most common features that TMG users are familiar with, including single sign- on, AD integration, customisable forms and dual factor authentication. An ideal replacement for Forefront TMG in a reverse proxy scenario. The optional Web Application Firewall (WAF) combines application-level firewall with intrusion detection. With this feature enabled, KEMP can safely replace TMG at the network edge. 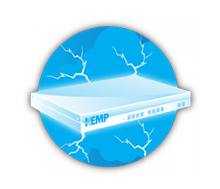 KEMP LoadMaster Load Balancer is available as a virtual appliance (Hyper-V, VMware, KVM, XEN) or as a rack-and-go hardware appliance. KEMP Loadmaster is now available throughout Africa. SUREFRONT supplies and supports organisations in many countries, including Nigeria, Kenya, Burkina Faso, Guinea, Gabon, Cameroun and South Africa.